The deep-water offshore construction of the first line of the TurkStream natural gas pipeline is now complete as the world’s largest pipelaying vessel, the Pioneering Spirit, reached the Turkish shore off Kiyikoy in northwest Turkey on Monday. Pioneering Spirit captain Loek Fernengel told journalists on the vessel that Allseas, the company that owns the Pioneering Spirit, has the most technologically advanced pipelaying vessel in the world in the Pioneering Spirit, which is not only designed for pipelaying but also for the installation and decommissioning of oil and gas platforms. The vessel has a maximum speed of 14 knots and can accommodate 571 people with an installed power capacity of 95,000 kilowatts. “This is a unique vessel with the size of 6 Boeing 747s, and is able to lift 2.5 Eiffel Towers at once,” Fernengel said. “The vessel’s construction started in 2012, so we can say that it’s a newly-built vessel,” he added. The vessel is among a fleet of other Allseas enormous vessels including the Solitaire, Audacia and Lorelay. A group of journalists was given first-hand experience of life onboard the Pioneering Spirit where they were able to meet the crew in person. The vessel with 13 floors and 288 cabins can cater for over 500 employees at any given time. However, it is not all work and no play as the crew from over 40 countries has recreational areas with Playstations, television screens and facilities for various activities such as ping-pong and foosball. “We have 130 technical crew members including mechanical engineers and electricians, 40-45 personnel for catering, 300 employees on the production line and 50 marine crew,” Fernengel explained. The catering crew serves between 1,500 and 2,000 meals daily on board, while 250 kilograms of rice and 11,000 eggs are consumed per week. The captain shared that the majority of the fruit and vegetables, milk and canned goods are bought from Turkey. “It’s like a 5-star hotel. It can accommodate up to 571 people. There are laundry facilities and room cleaning services for the staff. The vessel has a capacity of 21 million liters of diesel but our daily consumption is 100,000 liters. With full speed it is 400,000 liters per day,” he said. The TurkStream construction project has so far been very successful, Fernengel said. “Even in the event of massive waves, the vessel remains stable and we continue to work. There was a huge storm about a month ago. The waves reached 7-8 meters high and the vessel suffered some damage but it didn’t stop our production. Every eight minutes, we lay one pipe in the sea. “We found aircraft wrecks and archeological sites on the seabed during pipelaying. We changed our route each time but there has been no delay nevertheless,” he explained. As an example of the speed of work, Fernengel explained that the speed record achieved in February this year was 5.7 kilometers of pipe-laying daily. The crew welded more than 74,000 pipes with a mere 0.63 percent margin of error, he added. The Captain confirmed that when the pipelaying for the first line of the TurkStream is finished, the crew will take a 10-day break and return to Rotterdam in the Netherlands. “After this location [offshore Turkey], the Pioneering Spirit will return to Rotterdam, to prepare for her next heavy-lift project – the installation of a 22,000-tonne drilling platform topsides for Norwegian Statoil’s Johan Sverdrup development on the Norwegian continental shelf,” he said. He added that in the third quarter of 2018, the Pioneering Spirit will return to the Black Sea to complete the second line for the TurkStream project. 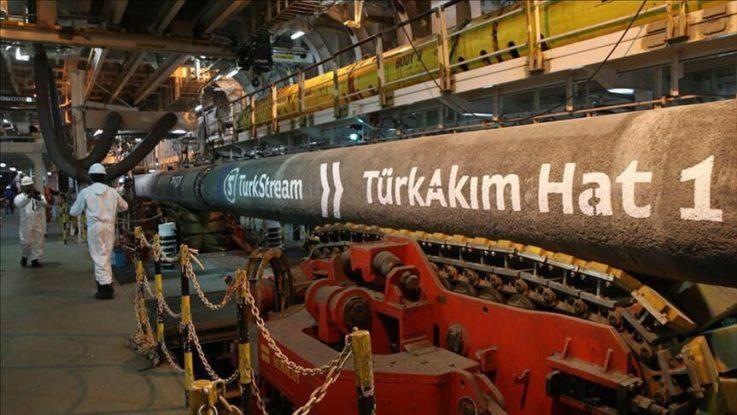 TurkStream’s spokesman Sander van Rootselaar also informed the visiting group of journalists that to date 224 kilometers of the second line has been completed. “For the offshore part, we have all the necessary permits. The onshore lines are beyond our remit. Those will be the responsibility of Turkey’s BOTAS and Gazprom. They are in talks for a joint venture regarding the second onshore pipeline,” he said, adding that the first gas from the project will be pumped in December 2019. “The project is a clear benefit for Turkey as it’s a direct line to the country. The negotiations for gas price are ongoing. We have to wait to see how they develop,” he said. The Swiss-based Allseas Group executed nearly 300 projects worldwide, installing more than 21,500 km of subsea pipeline in water depths ranging from 5 meters to 2,730 meters. The Pioneering Spirit commenced offshore operations in August 2016 with the removal of a mobile production platform from Norwegian waters.